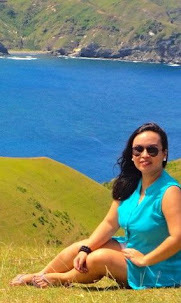 On our second day in El Nido, Charisse of La Tiara Tours had arranged our island hopping activities. Since we wanted to maximize our time in Bacuit Bay, we decided to embark on a combination tour (tours A & B). The tour is priced at Php 1,300 (minimum of four pax). This gave us savings of Php 200 because if we had booked tours A and B separately, it would have cost us Php 1,500 each. The only downside with combination tours is that you'll have less time to spend in each destination. Think Amazing Race. After having breakfast at Marina Garden Beachfront Inn (service is kinda slow by the way, so make sure to keep bugging the staff on your orders), we walked towards Ricsons just a few meters away from our base camp. Charisse and her family were already there, waiting for our group. After we paid an environmental fee of Php 200 (good for 10 days), we boarded Ricsons' boat and off we cruised the idyllic Bacuit Bay. Once the boat's engine had started creating a roaring sound, our tour guide, Genson, introduced himself and did a little orientation on our itinerary for the day. The first half of the day is dedicated to Tour A. Meet Genson, our reliable tour guide and lifeguard rolled into one! Our first stop was the Small Lagoon. Tucked in a postcard-perfect row of limestone karsts, the Small Lagoon is one of the most photographed sites in El Nido. Due to its proximity to El Nido Resort's Miniloc Island Resort, the lagoon is often frequented by foreign and local tourists alike. It is the best place to go kayaking, so unless you are a guest of Miniloc Island Resort (in which case you are entitled to use their yellow kayaks parked inside the lagoon), make sure to ask your tour guide to bring a kayak. This is usually charged at Php 800 (whole day rental). When we arrived at the entrance of the Small Lagoon, there were already a lot of boats parked side by side. It was low tide then so Genson suggested that we just swim our way to the lagoon. I highly commend Genson for patiently guiding us, making sure we do not step on sharp rocks along the way. And by 'patient' I really mean it in every sense of the word! Aside from the sharp rocks, we were also trying to avoid the sea urchins that line the sides of the lagoon! There were so many! No wonder the Small Lagoon is always included in the must-see places in El Nido. It looks as magnificent as it was in the photos! As we enter the lagoon, the breathtaking views made us really feel like we were entering a giant postcard! This entrance to another lagoon is kinda deep. For non-swimmers like me, please make sure you wear a snug-fit life vest. You may also snorkel while crossing the deeper part of the lagoon. On our way out, we were trapped due to the congestion of boats parked at the entrance. It was challenging for the boatman because aside from trying not to bump into the other boats, he was also trying not to smash the boat into the giant rocks. Our next destination was the Big Lagoon. Our boat stopped at the entrance and the guide said we should swim just up to the brim, and from there the water will start to get shallow. There is also a small sand bar at the side so you can leave your stuff there while enjoying the calm waters of the turquoise lagoon. Smaller boats can actually get inside the Big Lagoon. You can also do kayaking here as the water is calm and tranquil. Tour A is all about lagoons and beaches. We stopped at a place called Secret Lagoon, where we had to sneak into a small hole to get inside the lagoon. The lagoon is nestled right beside a powdery white sand beach. Getting inside the lagoon is a challenge! The Secret Lagoon is smaller than the two lagoons we had visited earlier that day, but it has its own unique charm. The vibe is similar to Tangke Saltwater Lagoon (click here) in Islas de Gigantes, Northern Iloilo. The shallow water is so refreshing to look at. When we got out of the Secret Lagoon, we took some photos of the island. The amazing rock formations are indeed a feast for the eyes. So beautiful! The Secret Lagoon is a famous stopover for picnic lunch. Here, the tour guides have their improvised kitchen by the rocks. Cool! Our guide is not only patient in assisting us in the water, he is a good cook, too! 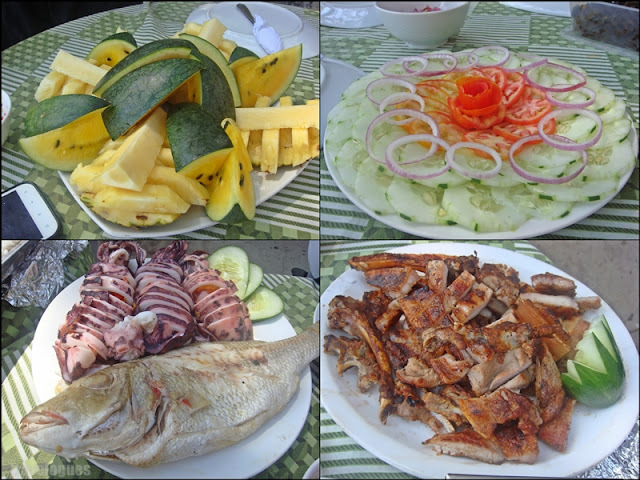 Our lunch was composed of grilled squid and pork, steamed fish, fruits and cucumber salad. Sumptuous, indeed! The Secret Lagoon has a nice beach, too! After lunch, our next activity is fish feeding at Simizu Island. We did not dock at the island itself, rather, we docked a few meters away from the shore. When our boat's engine shut down, we asked Genson where the fishes are because the water is so quiet that it seemed like there were no living creatures beneath. And so he threw some bread in the water, and voila! Fish. LOTS OF THEM! Enthralled, we all jumped into the water with our snorkels and masks on. Fish feeding is so addicting, I must say. After saying goodbye to our little colorful friends in the water, we continued with the next leg of our tour - Tour B - which I will be writing about soon. Meanwhile, let me share some of my sunset photos while cruising Bacuit Bay on our way to our last stop (for Tour A), the 7 Commandos Beach. 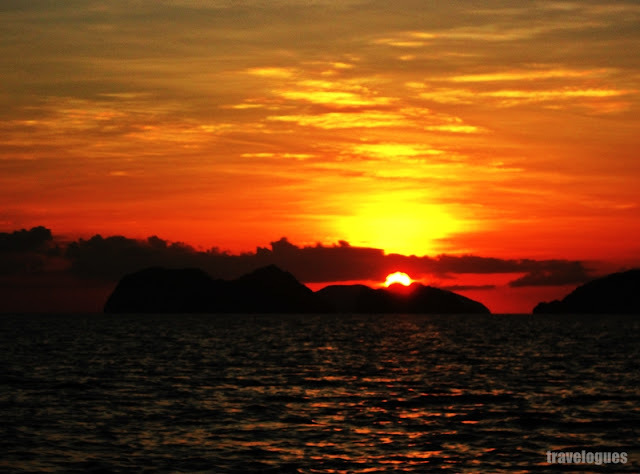 There is something to Palawan's sunset that captivates my heart. Vivid, the bursting shades of red, orange, yellow mixed with the blue skies look spectacular. We were actually hoping to catch the sunset in 7 Commandos but we ran a bit late. It was already dark when we arrived there. Lo and behold, we still had our doze of the vibrant sunset, and catching the waves backdropped by the magnificent views by the shore completed the day. How to go and where to stay in El Nido? grabe sa shimizu, patay gutom ang mga isda. hehe ang dami!! !